24.05.2010 The code for the file “ChartUsingGoogleVisualizationAPI.js” is updated. Modified the array of fields to use for chart label and value columns. The two now uses the same array: ‘Number’, ‘Currency’, ‘Text’, ‘Calculated’, ‘Boolean’ ,’User’ ,’DateTime’ ,’Choice’ ,’Lookup’. The version number is now set to 1.0. 21.05.2010 Added support for Lookup column as “Chart value column”. The code for the file “ChartUsingGoogleVisualizationAPI.js” is updated. 12.05.2010 Added support for Lookup column as “Chart label column”. The code for the file “ChartUsingGoogleVisualizationAPI.js” is updated. 11.05.2010 Added some examples at the bottom of the article. Fixed this issue noticed by Charlie. : Each time I edit the CEWP/Chart, the “Chart label column” field returns to the top-most selection. An example on Custom CAML is added (see image below). The code for the file “ChartUsingGoogleVisualizationAPI.js” is updated. 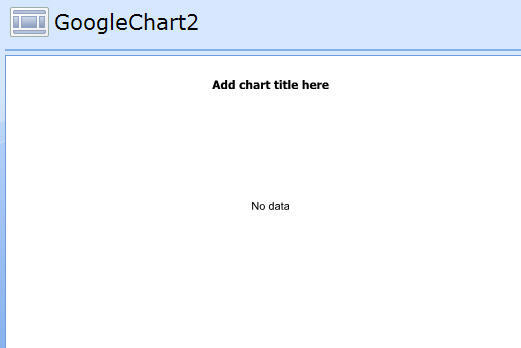 This is a solution for creating charts directly from SharePoint lists using Google Visualization API. The solution is a CEWP-solution and requiring no other than a few script references. All code and data are processed and rendered in the browser. No data is sent to any server. The solution features “Sum”, “Count” and “Average”, and can pull data from any column type, including calculated columns. 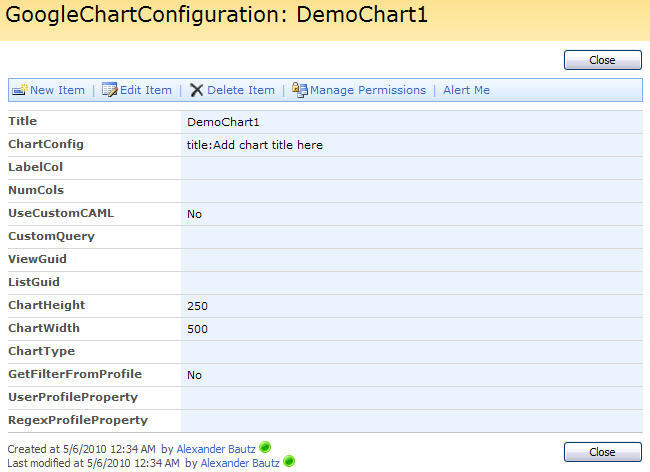 The chart config is stored in a separate “chart config list”, but all the configuration is done in the GUI seen in the bottom picture. You can pull data from any existing list view (even from personal views – for personal use), or using a custom CAML-query. 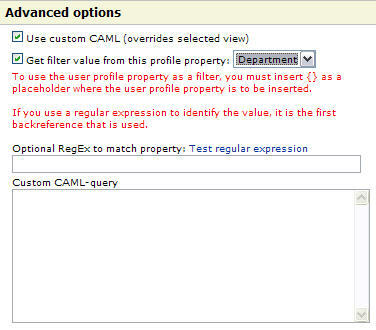 If you use a custom query, you have the ability to filter the data source using a user profile property pulled from the user profile of the logged in user. Note: These are FieldInternalNames and must be exactly like the above fields. The GUID for this configuration list is used in the CEWP code below. Read here how to get the GUID for a list. // The "People and Groups" list – must be set to support filtering by user profile data. 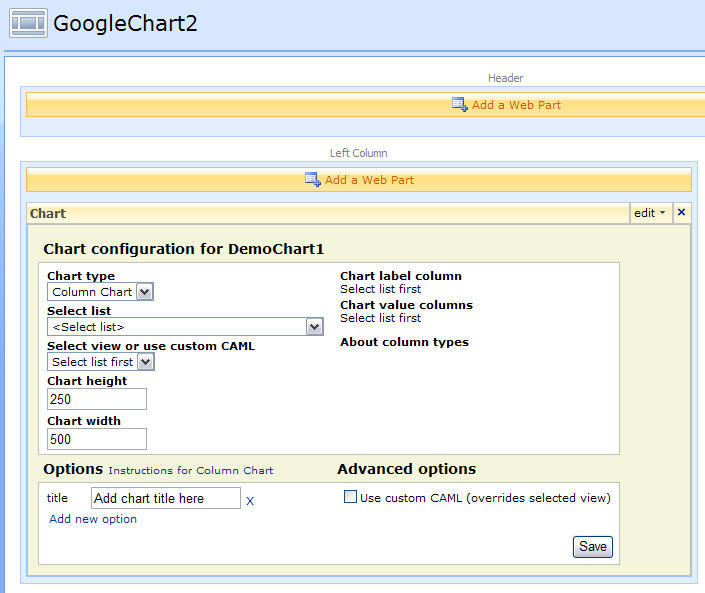 A “chartID” can be “reused” if you want the same chart to appear in multiple pages. The chart configuration list is not suppoosed to be “hand edited”, all configuration are done trough the UI in “Edit page mode”. There i however nothing that stops you from hand editing the configuration if you like. // If the name is added with a comma and a description – like "Bruce Springsteen,Bruce Springsteen<br /><div style="text-align:center"><font color="red"><em>The Boss</em></font></div>"
Hover over the code, select “view source”, highlight and copy. Save as “ChartUsingGoogleVisualizationAPI.js”, mind the file extension, and upload to the scriptlibrary as shown above. The “container div” can be inserted in a CEWP holding text or other content. You must ensure is that the CEWP holding the script are placed in the bottom (right) web part zone to ensure that the containers are rendered before the code “needs them”. Wow! Absolutely stunning! I know I will love the result, can’t wait to see your script. Your UI development is amazing. Keep up the great work. Working really well ! This is a really impressive piece of work. The list that is referenced here no longer exists. Any suggestions as to how to troubleshoot it? Good work on your part, this can be very handy. 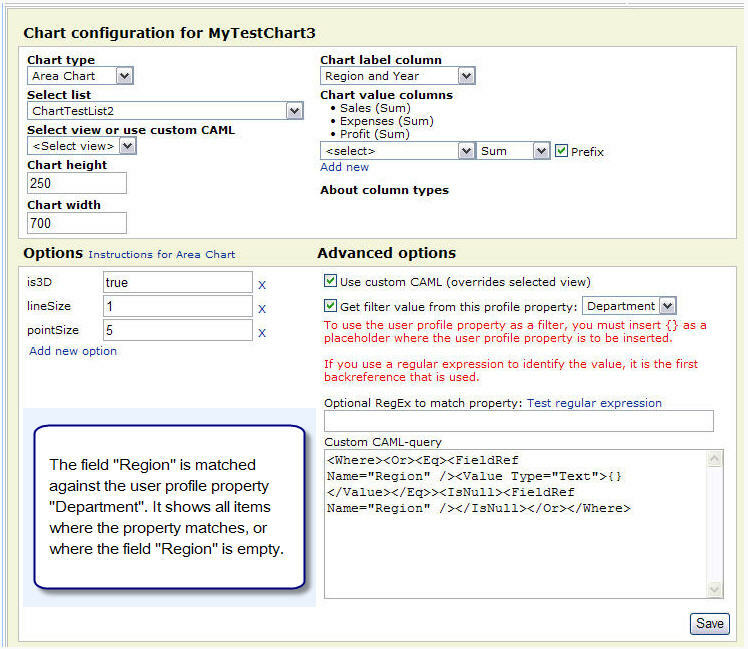 The chart configuration list must reside in the same site or subsite as the chart is to be used. You will need to crate a copy of the chart config list in each site/subsite. This is another stellar piece of work! One note: I tried to use currency and it does not work. I changed it to numbers and it works. Any clue or fix? Added support for Currency – i actually thought it would sort under “Number”, but no… Fixed. Each time I edit the CEWP/Chart, the “Chart label column” field returns to the top-most selection. Is there any way to keep the prior selection? Again, this is amazing work Alexander. Celebrate your new celebrity and go out for dinner tonight! I believe this should be fixed. Please test and report back. 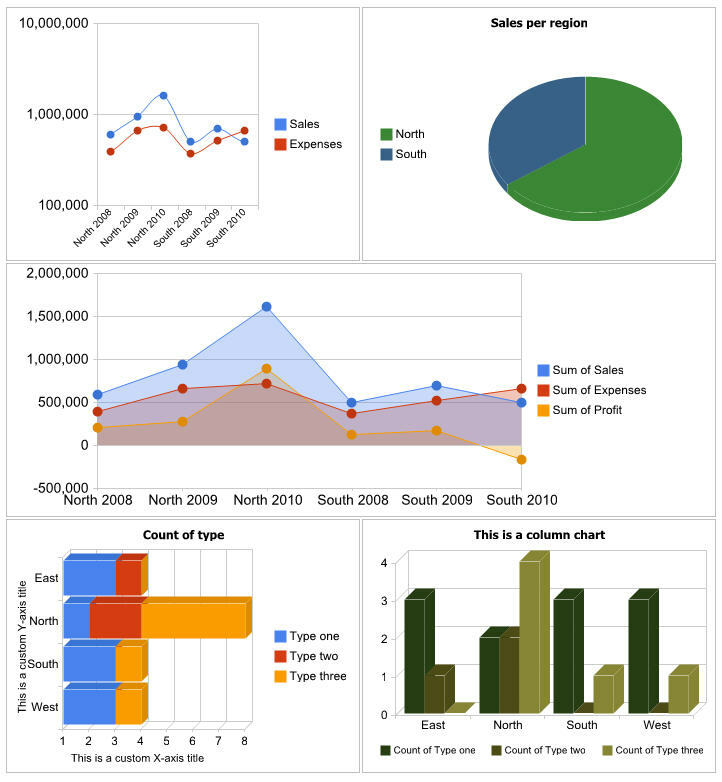 How do you add multiple CEWP to display charts. i add one, then go to add another and give it different config name that writes to config list and works but other one disappears. Probably missing something simple. It should be enough to include the <div> in a CEWP in the page, and call the script once at the bottom of the page, with the reference to both/all “container id’s”. Could you send me an example? I just want to make sure I’m clear. I have the script running in a webpart zone with a CEWP without <div Id reference. I have added 2 charts, each added to its own web part zone. On each one i reference their id by adding and on the other . So test is the only one showing. As you can tell, I am not much of a programmer – which is a testament to your instructions – well done. My last reply was not edited correctly. 3 web part zones – One holding script and the other 2 holding CEWP’s referencing a ID. Only configuration UI showing is Test. How do i get DemoChart1 config UI to show also…and others would follow suite. The article is updated with an example. Please let me know of any trouble you might encounter. This goes to everybody! – please test the solution and post back any issues, either it is “success stories”, bug reports or request for changes/modifications/enhancements. Thx Alexander. Only reason i could not test your recommendations is i was not clear on what to do. Appreciate the help. This works great! The only issue that I have (and is probably due to how SharePoint works) is in the “Chart label column”. It does not show a column that is based on the Lookup option. Or is there a way to select data from multiple lists? Thanks so much! I will be trying this at work tomorrow! The new code works great! Thanks for making those changes. I tested the code, charts can be displayed well in firefox but not in IE 8, is there any configuration to do? Try putting the site into “trusted sites” under security settings in IE. This is great work. It is such a great way to take advantage of existing tools and pull them into Sharepoint. I followed your tutorial, and everything works great. Have not tested across multiple browsers, but IE6/7 and FF seem to work just fine. I had one question, and it pertains to functionality. With the existing build, can the count function for any field be extended to count the number of different values in the field rather than just the number of total entries? For example, if I have a field that has all Yes/No values, can the code be extended to count the total number of yes and no values for display within a chart? IF this is not possible yet, it could be a good enhancement for the ability to have different types of functions for slicing and dicing the list values. Once again, great work with this piece…. That is not possible for now, and i so not now of any other method than to create calculated columns to “split” the values into two columns, and then to chart using the calculated columns. I am trying to make a custom CAML-query, and am using U2U CAML to make the code. In the programe I can do Today-15 and it will query it in the program, however when I am transfering it to the custom field I get no data. Do you know why that id and how to fix it? Here is the code I am using: [Today-15Day(s)] . I need to show data for the curent month (+ and – 15 days). If there is a beter way I would gladely use it. Thank you! this is perfect for me :)! Code updated to add option to use single item lookup columns as “value column”. excellent! can this extend to display Site Usage Reports? If yes, what all do I need to do? anyone done it before? As far as i know this is not possible as the site usage report is not stored in a list. The code for the file “ChartUsingGoogleVisualizationAPI.js” is updated. The array of fields to use for chart label and value columns is modified. The two now uses the same array: ‘Number’, ‘Currency’, ‘Text’, ‘Calculated’, ‘Boolean’, ’User’, ’DateTime’, ’Choice’, ’Lookup’. The version number is now 1.0. Alexandar, thanks for the prompt reply. If I’m implementing the “ChartUsingGoogleVisualizationAPI.js” is any of my SharePoint List data (corporate data) being sent to Google, in any form or factor? Off topic, but if you happen to know, could you guide me in a direction you are aware of a free sharepoint charting software which would allow me to do some graphical site usage report? I have no answer to your question, sorry. Alexander thanks for clearing my doubts. I can’t get it to work, IE always reports a script error “Object expected” which refers to this part of the rendered page. I’ve got only two webparts on the page, on that should display the chart and the other one is your script. The configuration list is addressed, also is the user list. I had a look at Endusersharepoint, one of the comments had the info that was needed. I had to give absolute references to the scripts, now everything’s working. It seems that ‘the other” scripts (interaction.js and stringBuffer.js) won’t be found by sharepoint if not addressed with absolute path. Hi, everything works fine now, except one thing that I haven’t been able to figure out. I’ve build a chart reflecting incidents per week which is a line chart with a counted value of one column. The counts work ok, but for the weeks it returns numbers with 13 decimal zero’s which is not exactly what I want to see 🙂 The week number is being pulled from a calculated field that returns a numeric value with no decimals. A similar problem exists with a second chart, this time a column type chart which shows the average duration of an incident. Again, the column numbers contain 13 decimal zero’s, the field data comes from a calculated numeric field with no decimals and what’s strange, the numbers are not sorted, e.g. the columns are named 3,4,10,5,6,26,13,…. each with up to 13 decimals. I have tested it and can conform your findings. This is the same behavior as it is when filtering a list view on a calculated column containing numbers only. I will fix it in the code, but a quick workaround would be to set the calculated column to return a text like “Week: 12”, in stead of only “12”. Note the &” ” at the end. Is there a way to to be able format the tool tips? Right now it’s showing three lines of text, first one with the calendar week, next with the description (“count of calendar week”) and a last one with the number of entries. The tooltip format is default for Google Visualization API, i cannot change it. There may be some options to format it in the “options” section over at Google’s site (linked in the chart config). Was wondering if you could add the ability to add Slice Labels to the pie chart. The solution uses Google’s “Visualization API”. There has been released a new version on may 18′th, but i haven’t had the time to update the code. This new update introduces data values on pie chart. Thanks Alexander, this worked perfectly. Error: ‘match()….’ is null or not an object. May be I am doing it the wrong way. I want to show the chart for a list with a choice field of domain….where the bar graph will show no of request in different domains. I add Domain as title field and domain(sum) as the Y axis….please help. Looks like an error in one of the “regular expression handlers”. Could you please send me a screenshot of the chart config (in edit page mode) and one example on the values from the list it tries to render. I’ve had this error too, only thing that helped me was to start from scratch with the chart, most of the times it has worked then. Great job!. Couple questions though. I added this to a site and is working fine. However when I try to add a 2nd CEWP to a webpartpage, the 1st one doesnt display anymore. I just copied the script from the 1st CEWP into the 2nd CEWP and edited the “DemoChart1″references to “DemoChart2”. Do I need to make any other changes? I read your Q/A above but didnt see anything that would answer this. Everything is on one site, so there are no cross site issues. Also, can any type of data labels be added to the chart (ie within the slices of the pie chart display the # and/or %? 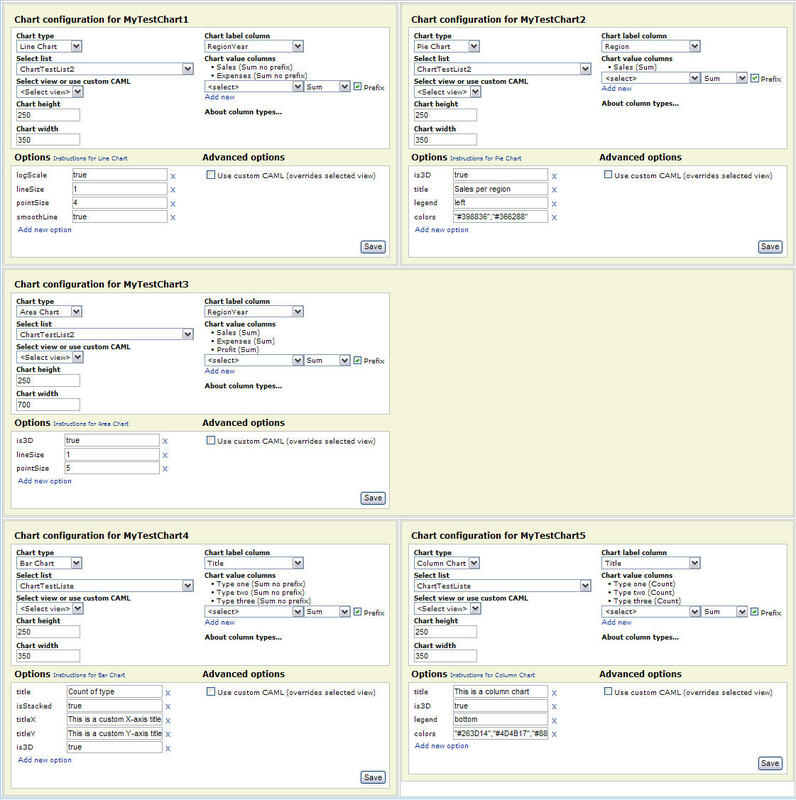 In the parameter “arrOfChartContainers” you add all the container id’s. Just assure that the script is called at the lowest position of the page – to make sure all the CEWP’s with the containers are rendered before the script is called. Each of those fixes worked great. I have a new issue/question to ask though. Will do that with new item here. Thanks for your help. I got everything setup last week and with your answer to a couple questions everything was working fine. I have a webpart page with 6 cewps on it where I am displaying different types of charts. However all day today I am noticing that the charts dont always render. Sometimes they do, sometimes they dont. Mostly I just see the cepw titles only on the page. Any idea why this might be? Im within a corporatve environment. Might there by network things blocking the calls to Google? Seems odd that it works sometimes and not others. Any thoughts are appreciated, and again great job. I dont get any error messages on the page. I have no idea what could cause this, sorry. Please notify me if you find out more. Error: ‘thisCartConfig.ID’ is null or not an object. I digged a bit in the code of the ChartUsingGoogleVisualizationAPI.js as the error refers to line 77, but to be honest, I js is not my favorite language. Any help? All scripts are loaded correctly.. This solution does work in IE6. If the “chartConfigListGuid” is wrong, you would get this behavior. Verify that it is correct. Btw, I updated the CEWP script to use the new package:corechart as reference as it provides the additional feature to display the values in the chart. I can’t seem to find what is wrong. Any ideas? Check the list GUID for the config list. If this is correct it has to be one of the fields in the cofig list that has the wrong FieldInternalName. I checked them all multiple times but coudl find a problem. I deleted the config list library and made a new one and it seem to sort it. Thanks. Now while i have you. Is there anyway i can pull the data from a form library? The data is in the columns but the problem is that any form library’s do not come up in the Select List option. So I can’t get at the data. Yeah XML Form Library is 115. I taught I needed to change the getListCollection to the getFormCollection. But removed 115 and it worked. Thanks Alex for putting this together. I am currently attempting to get your set up to work with a Visualization Motion Chart. Would you say that with a few changes here and there within your code this would be a plausible goal? Did you try to set up the code to enable additions like this, or should I just consider myself back at square 1? Are you using “sum” on a text column? I think this would give this error. No, I was using COUNT. I have changed no the result of the calculation to a value (1) and made the sum.. this works -> chart is beeing displayed. Some of the options will not work. For example, hAxis.title. It will not display. Is it possible to display data labels? I didn’t see that on the google chart config options page. the package currently uses the ‘old’ format of the google charts – therefore to add a title you have to use titleX instead of the new hAxis.title function. For Column & Bar charts it seems that the google charts don’t provide an option to have datalabels directly displayed (a pitty you want to copy that to presentation) but all info can be gathered while hovering over the bars. I didn’t see your answer before answering above – thanks. I modified your code to implement a motion chart rather successfully with 1 caviot: is there any way to display the data without it being summed, averaged, or counted? Also, when I set the options in your nice UI, they didn’t transition to the actual chart, any suggestions? I am chugging along at my project making edits to your script here and there. I found out a problem with “options” and have fixed that. My main problem now is the fact that the script only allows for String and Number types and as you may know, Google Visualization MotionCharts need Date type objects as their 2nd column. I see where you define the two data types in your code, but I am unsure of how to add the Date type. Do you think you could lend a hand in what I am trying to do? If you look at the API over at Google, you find all there is to know, but i cannot help you at the moment as i have no experience with this chart type. One more question. Is there an edit or addition I could make so that the data is not compiled to averages/sums/counts BUT just raw data from the list? I can’t really tell where in the code this process is going on and what I would have to change to just read the raw data. First of, great site Alex. Question : is there a way to show the date only, but not the time in a chart ? The datatype for my chart column is “date and Time”, and I select Date and Time format as “Date Only”. But in the actual chart, each column still displays the time portion as 00:00:00, wasting a lot of unnecessary space. The date is stored in that format in the DB. The “Date only” is just used when rendering in the browser. You will have to use a calculated column to get the date only. Another question Alex, how do I insert the actual data value marker on any of the charts? Let’s use a bar chart for example, how do I display the following ? as far as I have identified most of the google charts do not have any options for data labels being displayed directly in the chart. The only chart showing datalabels is the PieChart and here only if you use the new corecharts. Alex, I set everything up as your instructions suggest but after adding the CEWP with script and CEWP with statements, I don’t see the configuration interface load in the page. What could be causing this? I’ve loaded all the script files and have double checked the list ID multiple times. What browser do you use? – any errors reported from the browser? I got it working…needed to use the full path (including http) in the script file locations. i cant get it to work. I cant see the webpart in edit mode. it just comes up blank. I have the all the files in a directory, also added the GUIDS etc. Do you get any error message in the status line? It can be tricky the first time – only a missing ‘ or something can break the whole script. I have one set of charts/graphs that work perfectly. Other than changing the List Guid, is there anything else I need to change??? On my 2nd attempt I’m seeing alot of errors… For example “An error occured while creating the configuration container. The list that is referenced here no longer exists”. I confirmed my List Guid… Are there any other gotcha’s I need to look out for? Did you check the View-ID? And all the different columns you used in the first list the same as in the second? I only needed to specify the correct List Guid and use unique container names…. Your directions worked well. Thank you very much. Anyone using this code in conjunction with the “OrgChart” chart type? I’m testing it… So far I can create a simple Org Chart, no problem. However there are 2 issues that I’m struggling to resolve. 1)	How to handle the case of a manager that manages 2 different departments? The SP List looks good, but the Google API combined the contents of the two departments when it created the OrgChart… As a result, the two unrelated departments appear as one. So far, my only work around is to list the managers name twice, with each name having some additional text added to the end. It’s ugly, but it works. If anyone can recommend a more elegant way of handling the case of a manager whose name appears more than once in the Org Chart, I’d love to hear your solution. 2)	I’d like for more than just the employee name to be listed… I’d like to list the name, department and job title, etc…. If possible, I’d also like the ability to add some popup text causing some additional details to be revealed as my mouse cursor hovers over different names. So far, I’ve been unsuccessful at adding additional rows of text beneath the employees name. I’ve been successful at adding pop-up text to Org Charts in the past, but never before when using this code. If anyone has a suggestion for accomplishing either of these tasks, please let me know. I read the Google Org Chart does not support listing a managers name twice. I also read it’s currently not possible to change the Org Charts orientation from horizonal to vertical. And I’m still trying to figure out how to make the SP columns labeled “Department” and “Job Title” to appear beneath each name shown on the Org Chart. I’m using these charts and its awesome. I want to see Column chart like you have in “MyTestChart5”. But, I have only two column to use. – 2nd is Pass/Fail column: with YES and NO choice (For Chart Value Column), I use count. When I see chart It shows location correctly, but in value it is showing me count of YES+NO, Instead of two different column with count of YES and No. Is there any way to see YES and NO count on different column.?? 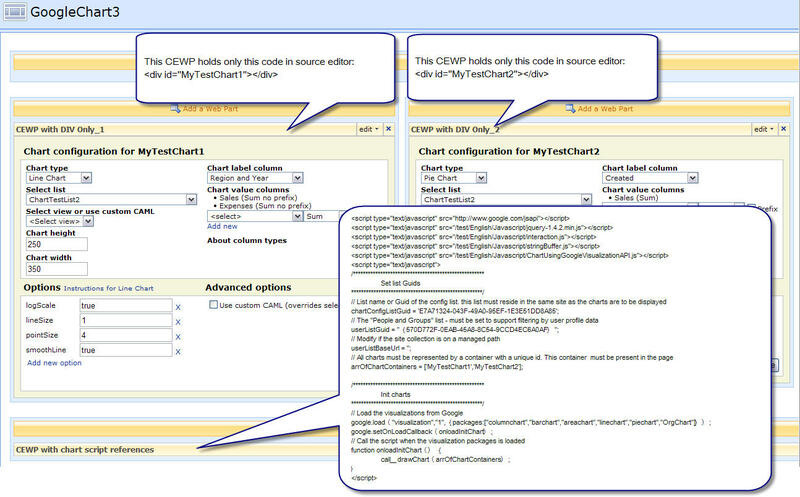 I have also changed the CEWP code to load the newer corechart package. This seems to work for the most part, but for a scatter chart I get an error saying that the X axis cannot be a string field, so the chart doesn’t render. The X axis is not a string field in my list, and the chart renders without problem using the older scatter chart package. I don’t know what is going on there. I did get a motion chart working by including the motion chart package in the CEWP code. I would really like to get a radar chart going, but I have not been able to do that yet. If anyone on this list has worked that out, I would appreciate knowing. I didn’t change anything, but now my chart titles and pieSliceText, etc… have all suddenly changed. Everything appears as small cursive text. There are new configuration options shown on the Visualization pages, but even when I try them, I can’t seem to revert back to my previously used style of text… Any ideas? I have started to work on a updated version of the script – adapting to the new version, but I’m not quite finished. Maybe i can post the updated code during the beginning of next week. With regards to the OrgChart, any suggestions on how to display something other than just the name? In my case, I’d like to display the name, department name and job title. To include other text things like job roles etc. please see the sample formula on the following post on EUSP. On there I have included another sample formula also which will let you include photos. I have an new version nearly finished… It will add many new chart types, including motion chart. awesome work! Thanks a lot ! But I have a little problem, I want to add an ‘Option’ “titleTextStyle” via the CEWP UI. I put “titleTextStyle” as ‘Option name’ and “fontSize:20” for ‘Value’, but nothing changed when the PieChart is shown. I tried it also for legendTextStyle, but the text doesn’t change. I have a doubt. How can I get the “userListGuid”? I think this is last thing for test in my sharepoint site, because the Item on googleconfiguration list was not created and the CEWP was empty, blank. Are you using the latest version of the script? There should be no need for specifying the userListGuid. Yes, now I am. Thanks so much.